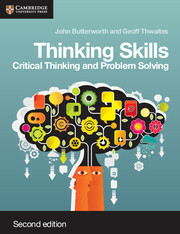 Thinking skills, second edition, is the only endorsed coursebook that provides complete coverage of the Cambridge AS and A Level Thinking Skills syllabus offering substantially updated, new and revised content. It also contains extensive extra material to cover related awards. Written by experienced and highly respected authors, this book includes features include clearly focused and differentiated units, stimulating student activities with commentaries to develop analytical skills, summaries of key concepts to review learning, end-of-chapter assignments to reinforce knowledge and skills, and a mapping grid to demonstrate the applicability of each unit to awards including Critical Thinking, BMAT and TSA.